I love movies. So, Oscar Sunday is my version of the Superbowl. I always like to make something sweet and silly to snack on during the show. And popcorn is so pedestrian. This is the Oscars! So I dreamed up this recipe for "Red Carpet Ready" Strawberry Upside Down Cake. It's really more of a muffin-cake than a traditional 'cake'. It goes deliciously with some Poor Man's Fire Chai as an after-dinner treat. Slice into thin long strips. 2-3 thin slices per berry. Try to cut slices that are very red on one side. Wash, de-core and thinly slice pears. Peel and very thinly slice banana - into long strips. 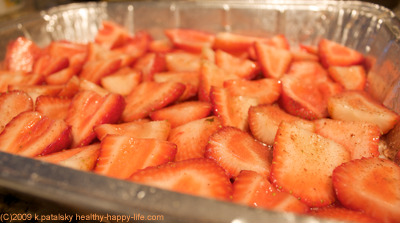 Add to large mixing bowl: Strawberry slices, pear slices, banana slices, 2 Tbsp. agave or maple syrup, 2 Tbsp. lemon juice, pinch of salt, 1 Tbsp. canola oil. Toss gently. Use a large cake pan or casserole sized pan. Grease with canola oil or use wax paper. Add a loose layer of the pears atop the berries. Add all remaining ingredients: dry mix, applesauce, lemon juice, soy milk, water, canola oil and sweetener. 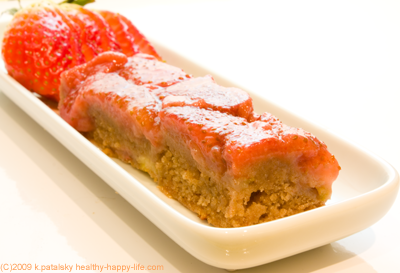 Fold in bananas, lemon zest and leftover strawberries (slice thinly). Add a few more pinches of flour if the batter seems thinner than you'd like. Add more soy milk if you want a lighter, thinner batter. Pour batter over berries, slowly. Smooth evenly to cover berries. Bake in a 360 degree oven for 40 minutes, or until top becomes slightly browned. Stick a toothpick in the center to test done-ness. Toothpick should come out dry. Allow to cool on counter for one hour. Then allow to cool in fridge for another hour - at least. When pan and cake is cooled and firm, loosen edges in pan with a butter knife. Gently pound the top and side of pan to loosen cake. Then quickly flip over entire pan onto large serving dish. Slowly remove pan. The top will be juicy. And hopefully the cake will not stick to any of the sides. Add all ingredients to mixing bowl. Heat in microwave for 30 seconds. Mix with hand blender or briskly with a spoon. Mix until creamy. Cool in fridge for a few hours. Drizzle over cake to serve. Strawberries are high in Vitamin C, manganese and folate. They are low in calories. Only 50 calories per cup. Bananas are high in potassium. Using whole wheat flour adds fiber.